My first visit to Chapter Arts Cardiff is a memorable one. I am attending the Go Faster Stripe DVD recording of Tony Law’s latest stand up hour: A Law Undo His-elf What Welcome and am unsure what to expect from the zany Canadian comic this time around. I’ve heard he’s changed a lot in the past few months. Tony Law arrives with his usual energetic vigour. He boasts a pair of Waitrose gardening gloves and has gaffer-taped his torso tightly, stating that he is ‘newly fat’, and is clutching on to two gymnastics ribbons. He opens the show with some interpretive dance. So far, so Tony Law. But the performer has another string to his bow this year. It seems that he has become wise in his recently found sobriety. This latest show is far more self-reflective than previous years; Law has slowed the pace down ever so slightly and allowed a glint of vulnerability to shine through. He declares that he’s developed stage fright since giving up the drink, as well as a fear of crowds. A big change in Tony’s life comes from the purchasing of a ‘therapy dog’, a beautiful black German Shepherd. The comedian spends much of his time walking his new dog in the woods near his home. 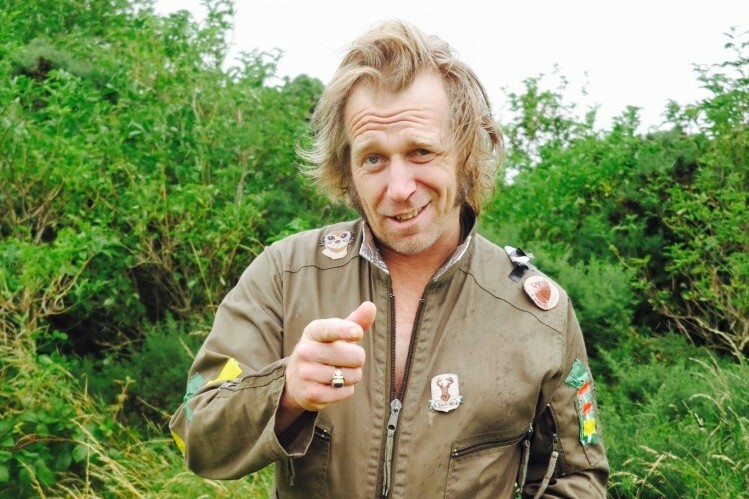 Of course, followers of Tony Law on social media will already be aware of this addition to Tony’s family, as he has a regular Instagram series entitled ‘Calling My Dog Back in the Woods’. His dog, as well as his family, are clearly this comedian’s world, and it’s truly a delight to see. But Law’s comedy hasn’t changed as much as his general presence has; the contents of this latest show is similar to past years, full to the brim with off-the-wall concepts and ideas. He’s an auditory as well as visual performer, and the inclusion of music and various sound effects (note his series of aeroplane impressions and infamous microphone-foghorn) are interesting ways of breaking up the material and ensuring that the energy in the room remains at dizzy heights throughout the show. Tony Law is somewhat of an enigma to me. No audience member can comprehend the journey Tony has taken, but his openness is refreshing. For a deeper insight into his transition from ‘off the rails’ Tony to the zen character we now see before us, listen to ‘Tony Law Returns’ on Stu Goldsmith’s Comedian’s Comedian Podcast. For those who listened to the initial interview back in 2014, you will notice a drastic different in his persona. This comedian may have settled down considerably but he is still excitingly energetic. And the best thing about this whole debacle is that Tony Law seems to be enjoying performing so much more. VISIT GO FASTER STRIPE FOR PHYSICAL AND DOWNLOADABLE COPIES OF STAND UP FROM AN IMPRESSIVE RANGE OF ACTS.